Pioneers in the industry, we offer lateral lldpe pipe, plain lateral lldpe pipe, polypropylene pipe, drip pipe, emitting pipe and jet emitting pipe from India. Manufactured form virgin LLDPE using advanced extrusion technology. - Short term & long term hydraulic pressure. - Tensile Strength and Elongation. Black in Ccolor with one parallel blue line. 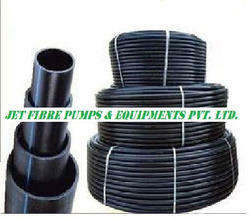 Jet Fibre manufactures High Density Polyethylene (HDPE) pipes under the brand name JET. 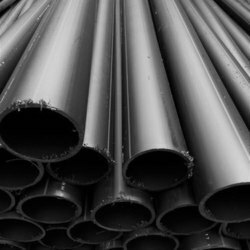 Jet pipes are manufactured as per the Indian Standards of BIS, IS-4894 up to size 400 mm in all pressure classes manufacturing from material grade PE100, PE80, PE63. 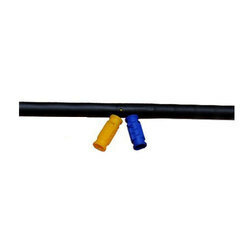 Jet HDPE pipes are manufactured under our License No. 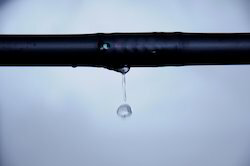 CM/L: 3673167 and are being widely used in various Industries to handle the flow of water, Liquid chemicals, underground pipelines etc., These pipes are also used in Drip, Sprinkler, Landscape Irrigations Systems, Lift Irrigation etc. Jet Pipes are manufactured in state of the art plant with latest manufacturing technology under strict quality control. 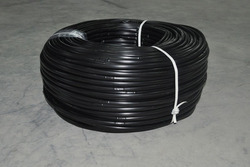 We also manufacture Polypropylene (PP) pipes to serve the industrial purpose up to size 400 mm. Sizes : 20 mm to 400 mm OD.